Begin by singing "This Little Light of Mine". Enrichment Idea: You might decide to darken the room and use a tiny flashlight or light a small candle during your discussion. Before you read, turn the lights on again. What happens if we decide not to show love and kindness to others? (allow for discussion) We are like the light that is covered up. We darken our world and that's a sad thing! But when we show love and kindness to others we honor God in our lives! To remember our lesson, we will create a special painting. What You Need: T-shirt or another item to paint on, sponges cut to approximately 1" x 4", acrylic paint (yellow, red-orange, green and blue), permanent black marker, napkins. What You Do: Dip the sponges into blue and then green paint to paint the candle and holder (as shown in the picture above). Have children press their thumbs into red-orange paint to paint the flames. 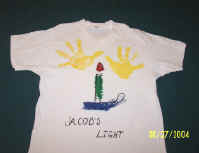 Now press children's palms into the yellow paint to paint the glow of the flame (their handprints). When the paint is dry use the marker to write child's name as shown in the picture. You might decide to outline the lamp and flame with the marker. End by singing song and with prayer. Your Support Partner makes the free resources possible!